It’s rare for to bake/cook something these days without sharing with you all my Foodventures. Therefore, you can imagine my surprise when an old neighbor contacted me looking for my Chocolate Espresso Cupcakes. She blames me for getting her hooked on fresh baked goods and then leaving her without her weekly sugar fixes 🙂 After apologizing profusely, I began referring her to the site when I realized I never posted a recipe for them. DOH! 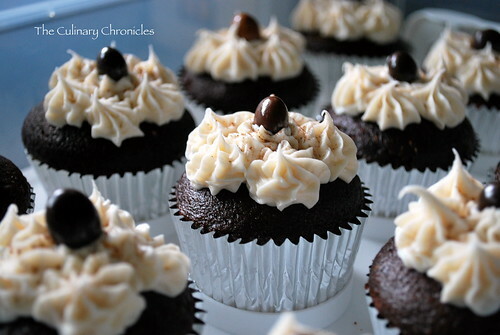 So without any other further delay—Chocolate Espresso Cupcakes with Mocha Buttercream. Extremely moist cuppies with light accents of espresso flavor. I paired these with a Mocha Buttercream and since its on the sweeter side, I suggest piping minimal amounts of frosting on these cupcakes. Top these bad boys with chocolate covered espresso beans and a dust of cocoa powder and you won’t be in need for any extra caffeine for the day! Preheat oven to 350 degrees. Line cupcake tins with paper cups. While cupcakes are cooling, prepare the frosting. In an electric mixer fitted with the paddle attachment, whip butter until fluffy. Add the cocoa powder and continue whipping until combined. Slowly add the espresso. It may look a bit curdled but don’t worry as it will come together once the sugar is added. Gradually add in the confectioners’ sugar, ½ cup at a time. Continue adding sugar to desire consistency. (I typically lean towards the full 4 cups for a firmer consistency to pipe the frosting). Refrigerate for at least 10 minutes before use. Once cupcakes are completely cooled and frosting is ready, pipe/frost cupcakes. Top with each with a chocolate covered espresso bean and dust with cocoa powder. These look amazing! I love chocolate and coffee…I can’t wait to make these! OMG!! I made these last night and they are absolutely delicious!!! I love baking. It is one of my passions and I have tried an assortment of chocolate cupcake recipes and I have never found one I like. The recipes I have tried have been dense and too chocolatey. This one is moist and perfect. I know this one has the coffee in it which makes them amazing! But do you have a recipe on here that is just a plain chocolate? I just joined your blog and I am just beginning to look through all your recipes 🙂 I can not wait to try more! I love making these cupcakes 🙂 I use a little more espresso in the icing (1/4th cup :p) to make it stronger, and I use 3/4 cup strong coffee and 1/4 cup brewed espresso in the batter (couldn’t find instant espresso anywhere first time I made em!) and they are perfect 🙂 I have one of my best friends who is anti-chocolate cake constantly begging me to bake him a batch 😉 thanks for a great recipe!